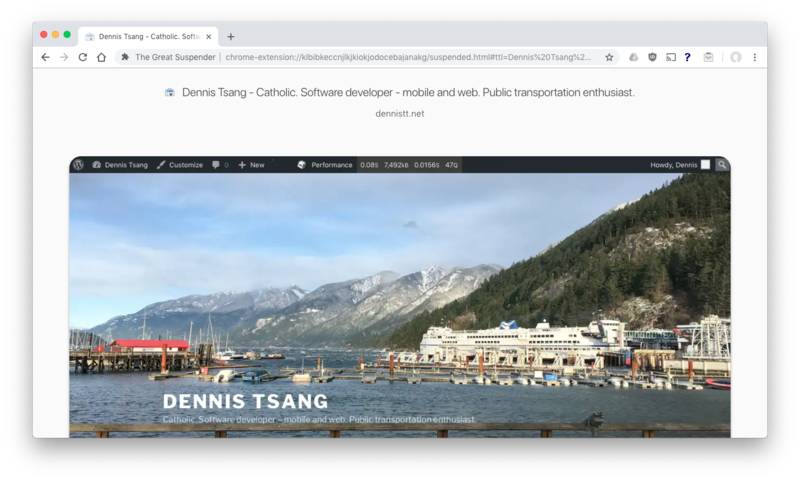 Dennis Tsang - Catholic. Software developer - mobile and web. Public transportation enthusiast. If you’re like me and have upwards to 30-50 browser tabs open at the same time, you may notice that your computer becomes sluggish. In my case this was because all the tabs still consume memory even though I might not need them for some period of time. I still like to keep some tabs that I might need to quickly refer back to later. I recently found a Chrome extension called The Great Suspender that automatically replaces the tab with a placeholder page after a certain period of time, optionally with a screenshot of what the page looked like. With the click of the mouse anywhere in the placeholder, the actual page reloads. The extension also allows you to manually suspend tabs if you know you won’t be needing the tab for a while, and whitelist certain pages or sites to never suspend automatically. I’ve found I can save a few GB of memory, which could be nearly 20% of total my system memory. Every bit counts! The Synology Hyper Backup app allows owners of Synology NAS devices to easily set up backups to various cloud services. However, one thing that isn’t shown in the app is the pricing of each service. So here’s a pricing comparison (prices as of Aug 4, 2018). Didn’t have time to figure this out, but looked more expensive than the other options. From the software point of view, it was all and well for the first 2-3 years. I had FreeNAS, Windows 7 and Windows 8 virtual machines running on it, and some lesser used Ubuntu virtual machines for playing around. With the IOMMU capabilities of the motherboard, I even was able to get the GPU accessible by the Windows virtual machines to use it as a desktop and even play some games on it. But there were some problems with the setup: Although PCI passthrough through IOMMU allowed my Windows virtual machines to access the hardware, the reliability wasn’t perfect. 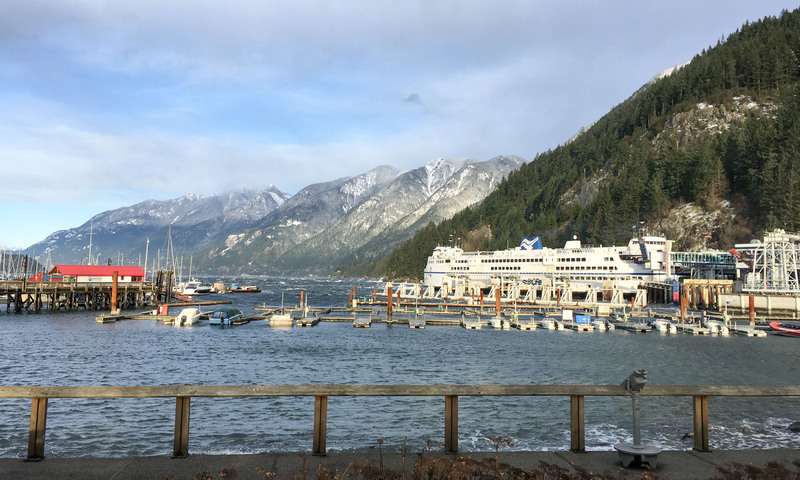 The main annoyance was that restarting the virtual machine would put the GPU in an unusable state, requiring a full restart of the physical machine. Other than that certain hardware components virtualized together sometimes caused random issues. The breaking point was in mid-2015 when one of the drives corrupted and I wasn’t able to boot my virtual machines. Due to a couple factors including not having disk redundancy, the proprietary nature of VMFS (the filesystem used by VMWare on the disk) and the VMDK (the filesystem of the virtual disk), recovering data was difficult, if not impossible (I technically still haven’t completed the recovery process). Luckily I had some data backups so I didn’t lose all my data. Later that year I bought a Synology NAS which has taken care of my data storage since then, and I took backing up more seriously following the 3-2-1 backup strategy. The incredible usefulness and utility of the Synology I’ve found over the past few years can be a whole other article! Anyway. VMWare ESXi was a fun experiment when I had the time to fiddle and troubleshoot it. Upon the rebuild I also tried KVM and Xen hypervisors to see if they had any better hardware virtualization with Windows guests, but couldn’t get anything working or stable. Since the Synology NAS took care of my storage needs, I decided the way to go was just to rebuild the computer as a Windows desktop. Over the years I’ve upgraded parts of the hardware, but up until last week the core of the system (CPU, motherboard, memory) has stayed exactly the same over the last 6 years. Here’s the original spec list, with the upgraded hardware in bold, and removed hardware stricken out. I was and still am very happy with this build, considering the core of the build has lasted me thus far. I think AMD provides a great performance and value to price ratio. I hope the motherboard lasts just as long for the new processor! 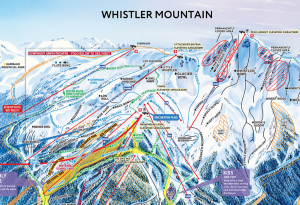 My cousins from Toronto came over to ski and snowboard at Whistler over the last month. 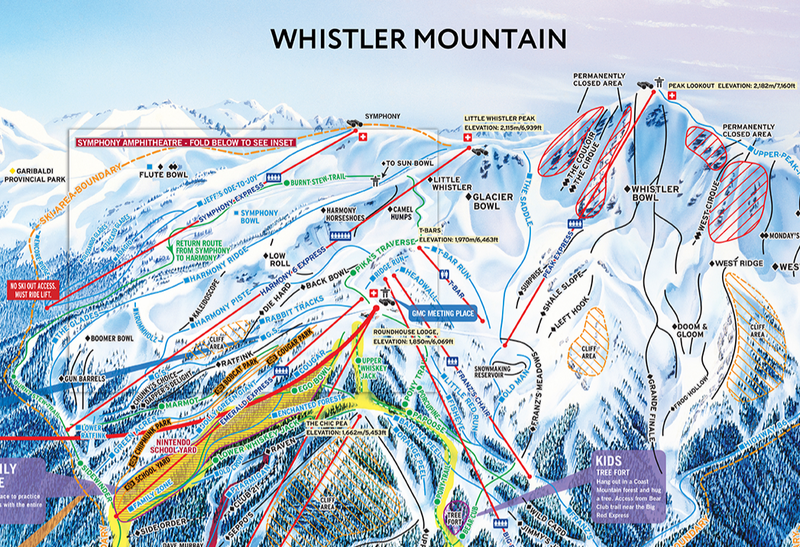 I had the opportunity to pick up skiing again and accompany them up at Whistler a few times. It looks nice and is mostly useful. But for all the map geeks out there, can we find anything better? 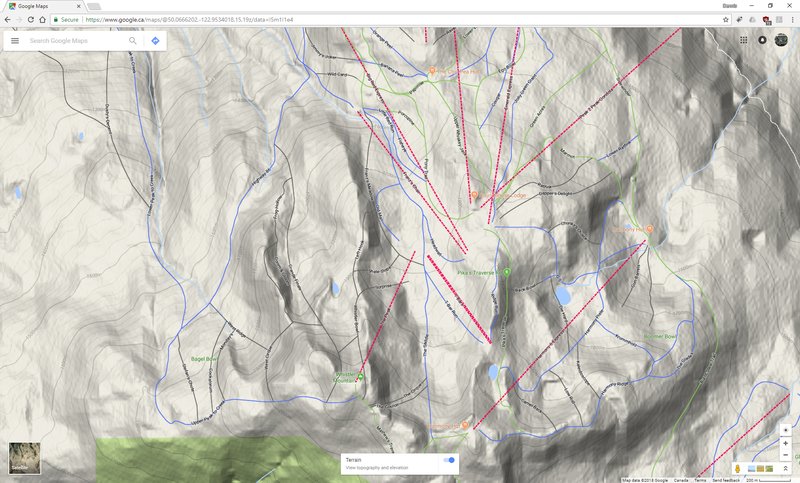 Turns out that Google Maps conveniently has the ski runs in its map. 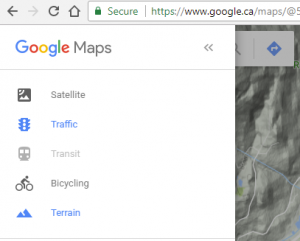 But there’s more: Google Maps in Terrain mode shows the contour lines like a topographic map! Beautiful! The top-down view makes it easy to see the actual orientation of the run and “behind” the mountains, and the contour lines makes the rate of descent visible. 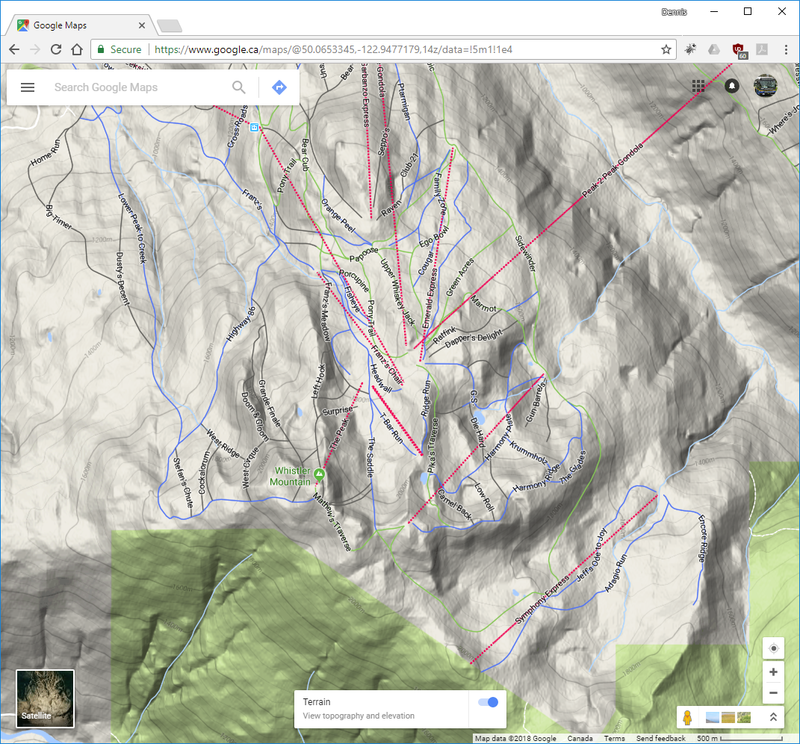 So from here you can see there is a green run from the Peak—Mathew’s Traverse—whereas it’s not depicted on the trail map. How do you get to the map? 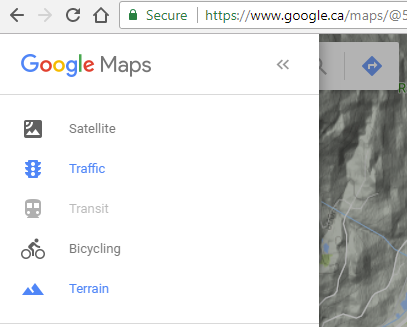 Alternatively you can search for the location you want in Google Maps, then open the menu at the top left, then select “Terrain” mode. My apartment building has an old hard-wired Enterphone intercom to buzz visitors in. This poses a slight annoyance since the dependency of the phone line in conjunction with a conventional corded telephone means I have to walk to the phone in order to answer the intercom. Given the low rate of visitors and the small size of my apartment, in retrospect, this isn’t really a big deal. Most normal people would just buy a cheap cordless phone and call it a day. But that only helps if I’m in the apartment. What if I wanted to be able to buzz myself in if I somehow got locked out?